(Money Magazine) -- Home improvement is one of the fastest-growing segments of e-commerce. But the consequences of a bad decision when it comes to finding a contractor or remodeling products online are far worse than buying the wrong paperback. What if those rave reviews you read about a contractor are ringers posted by his daughter -- or if your supposedly in-stock sink order doesn't ship for two weeks, throwing off your entire work schedule? Follow these tips to avoid glitches and get the most for your money. To find a contractor: Sites that are driven by consumer ratings are your best bet. That's because you get to see what as many as hundreds of prior customers say about all the pros in your area. Renovation wizard: Will your project pay off? Just watch for sites with anonymous postings and ads that appear in search results that look like positive ratings. In the New York, Chicago, and Los Angeles metro areas, or a few counties in New York, Connecticut, and Florida, check out Franklin-Report.com, which compiles user comments into Zagat-like ratings. Beyond those regions, a good alternative is Angieslist.com, which charges $5 a month, and uses the credit card info to prevent anyone from creating more than one login in order to post multiple revews. To vet a contractor: The next step is to talk to former clients and visit current and completed job sites. Sadly, there are no e-ternatives to doing this in person. But there is one key step you can do online: a background check. Get a report about a contractor's licensing, bonding, insurance, bankruptcy, civil judgments, criminal background, liens, and credit rating for $13 at contractorcheck.com, run by the credit bureau Experian. Sites run by home-improvement chains (such as HomeDepot.com and Lowes.com), boutique manufacturers (BeadBoard.com, Horizon-Shutters.com), and specialty e-tailers (eFaucets.com, TileShop.com) offer bigger selections than local retailers do. But the main attraction is price: Discounts of 10% to 50% aren't uncommon. Just keep in mind that if something goes wrong, those savings could turn into cost overruns. As with any online purchase, you run the risk of shipping damage or late deliveries, which can derail a project with multiple tradesmen working around one another's schedules. So order online only if your contractor okays it and provides technical specs; you're far enough ahead of the installation date to make other arrangements if there's a problem; the site is an authorized dealer for the brands you're buying; and if possible, you've seen the product firsthand. Otherwise, buy locally. It'll be easier to get matching items quickly if needed, and you'll avoid having to deal with a faraway call center if a problem arises. Stainless Steel Sinks were once a mundane kitchen necessity for washing dishes and food preparation. Kitchen sinks have now evolved and manufactures are now turning kitchen sinks into attention getting features and packing them with lots of innovative added function. Now they have more shapes, styles, and functions than ever before. Shining stainless steel mounted beneath stunning granite is now the designer trend to make your kitchen shine. A decade ago, Stainless Steel was deemed too commercial for upscale kitchens. 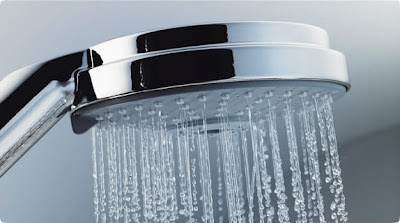 Now stainless steel and professional is uquated to luxury and more beautiful than ever. Stainless steel is again enjoying a place of honor in American kitchens. Here are six good reasons to use stainless steel for your new designer kitchen sink. The trend towards “green” building and decor is still going strong, with more homeowners, builders and designers looking for materials and practices that will reduce a home’s environmental impact. Stainless steel fits the “green” bill because it is recyclable. And modern stainless steel sinks, like Houzer’s Novus Sink Series, are often made from recycled materials. 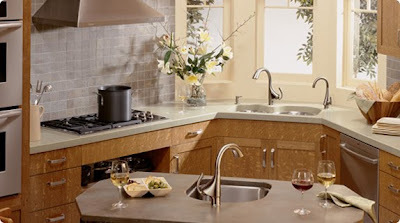 In addition, stainless steel’s durability ensures years of use and beauty, minimizing the need to replace and discard older, worn out sinks – thereby keeping them out of the waste stream. Gleaming, clean-looking with elegant lines, stainless steel easily pairs well with a range of decorating styles – from modern to contemporary to country. Stainless steel sinks also develop character as they age. Scratches in your enamel or solid surface sink might spell the end for the fixture, but stainless steel develops a patina of small scratches over years of use, lending it a natural depth of character that can easily be cleaned and buffed to shine like new. Versatility is as important as beauty in modern kitchen design, and new stainless steel sinks are more versatile than ever. With design options ranging from two- and three-bowl sinks and the ability to be mounted beneath countertops, to the capability of expanding a cook’s usable work space, stainless steel sinks afford wide adaptability. Extending countertop space is a popular feature, and sinks like Houzers Novus series meet the challenge with two sliding, removable platforms -- one with an integrated drainboard -- that are perfect for meal prep, staging and cleanup. Stainless steel is relatively light when compared to other sink materials, yet it offers strength and durability that ensure years of use when properly cared for. 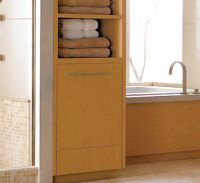 Modern styles achieve strength and a modern look without seams and mount well under the counter. 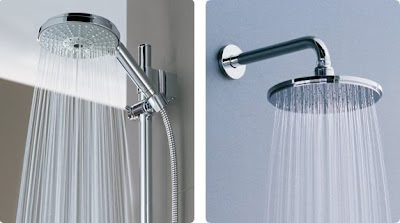 Stainless is also easy to clean and naturally germ resistant. Whether you have the budget of a home improvement show or a more modest amount to spend on your kitchen renovation, you can find a stainless steel sink to fit your budget. It’s possible to find an affordable, modest stainless sink for a few hundred dollars. And designer sinks, like the Novus line, sell at prices that compete credibly with high-end designer sinks of more trendy materials. Stainless steel lends itself to the classic clean lines of many contemporary kitchen designs, lifestyles and tastes. Once a stainless steel sink becomes the showpiece of a kitchen, its versatility and durability ensure that multiple owners will be able to use and enjoy it for many years. 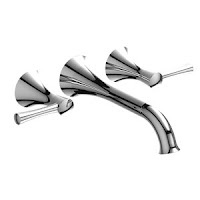 The FaucetExpert recommeds Houzer Kitchen Sinks for the designer home. Why? Simply because it is a better sink for a great price. 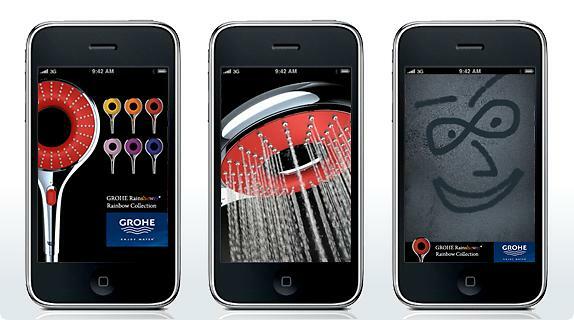 Houzer is more word of mouth among designers and they are not out there boldly spending all their money on advertising. The end result is that you get a better quality sink for the money compared to other more well advertised brands in home improvement stores. HOUZER understands that your kitchen is more than just another room. As the most vibrant and visible intersection of the modern home, it needs to be comfortable, functional, and versatile-as well as attractive and inviting. 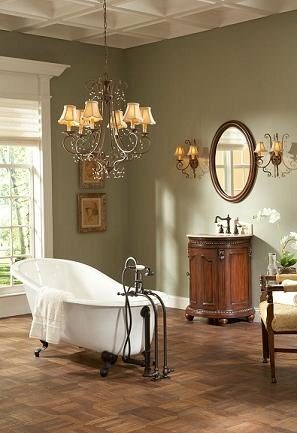 It's a personal setting that reflects your unique spirit and style. The kitchen is the undisputed center of the modern home. Today, it's where people gather to create a meal, share a story, and reconnect. A kitchen sink is a great reflection of your personal style in your new kitchen. Learn from our tips below to select the style that is right for you. Is your kitchen traditional, contemporary, transitional or rustic? Before making a selection, determine the shape, size, design and features you want that will best suit your everyday needs and style of living. 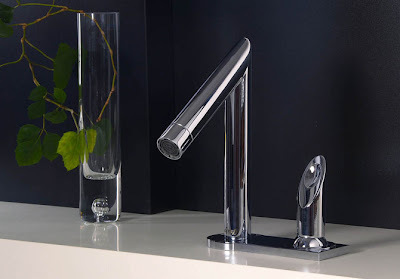 HOUZER sinks designs vary with each product family, you'll find one that's just right for your kitchen. Stainless steel is by far the most popular choice in appliances and sinks for a number of reasons, including the ability to remain new-looking much longer than other materials. HOUZER sinks are exclusively crafted from premium T304 stainless steel, the optimial mix for strength, shine, and lasting beauty. 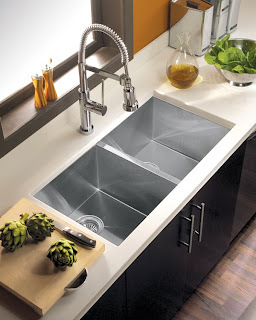 With minimal care, your HOUZER sink will look new for a lifetime. Best for stone or solid surface tops, undermounts are mounted from the underside of the counter, leaving a zero-barrier counter surface to sweep scraps and crumbs into the sink. If your countertop is laminate with a pressed wood core, you will require a topmount sink; the sink's bowl drops into a hole in the countertop and rests on the perimeter. Topmounts can also be used in a solid surface applications as well. How will you be using your sink? A resident home-chef may desire multiple deep, large bowls to accomodate stock pots and roasting pans. If you will be simply rinsing dishes, a single bowl moderate depth will suffice. When in doubt, a large deep single bowl is the best choice. Deeper bowls in the 9" range will accomodate large pots and allow for defrosting activities with larger food items. Deeper bowls also mean less splashing of water when in use. 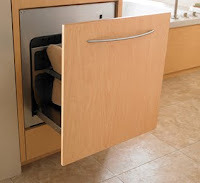 Shallow bowls down to 5" are ideal for food preparation and will also accomodate larger food disposal units. A well-placed prep sink in a busy kitchen can definitley improve flow and efficiency and can also double as a bar-sink in other areas of the house. Prep sinks of various depthsand shapes can be found built-in to many HOUZER models or purchased separately for locations like a countertop island. You'll find a HOUZER sink to match any design theme you have in mind; country to classic, transitional to ultra-contemporary. With arresting designs and sculptural details, HOUZER sinks achieve a dazzling presence for your kitchen and are the prefect complement to professional-grade appliances set against today's rich palette of stone, quartz, and solid surface countertops. Combining the highest quality materials and artisian's attention to detail, HOUZER sinks are painstakingly crafted to satisfy the sophisticated consumer who demands the very best. Every aesthetic detail is enhanced on every sink produced to provide lasting beauty and value to your home for years to come. For over three decades, HOUZER has been improving millions of kitchens across America and overseas, one sinks at a time. Sinks make your life in the kitchen easier and more enjoyable. HOUZER is a unique manufacturer and high-performance vendor based in New Brunswick, New Jersey. 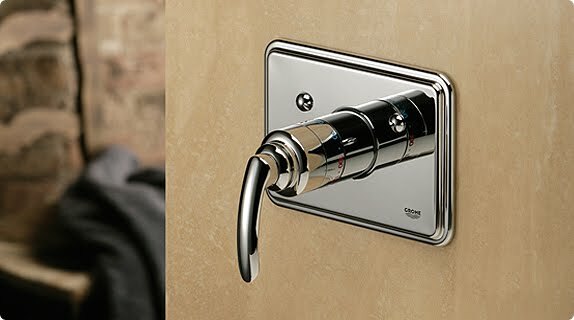 With two warehouse shipping points in New Jersey and California, HOUZER supplies sinks and accessories to plumbing wholesalers and decorative showrooms nationwide. HOUZER is the leading opportunity of any major brand name of premium stainless-steel sinks, unparalleled in its delivery of value and profitability. 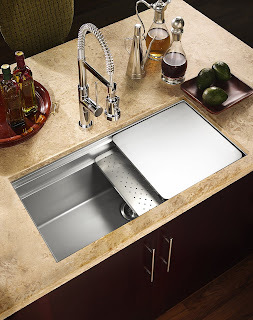 Major Hospitality and Design-Build firms use HOUZER as their ‘go-to’ stainless steel sink line. With special bulk-nested packaging for job-site shipments, HOUZER eliminates unnecessary waste at the job site, employing state-of-the-art packaging to withstand the rigors of transit and job-site environments. With so many offerings in the sector of stainless steel sinks, HOUZER stands out as a full-line, streamlined offering of popular sink sizes and designs. Our unique distributor programs have injected a well needed infusion of consistent quality and profitability into a cumbersome, political and saturated product segment. The HOUZER offering addresses all price points, thicknesses, and designs most used in the stainless steel sink sector. We’ve developed a series of proprietary features and benefits exclusive to the HOUZER brand. Mega-Shield™ Insulation has HOUZER’s exclusive StoneGuard™ Undercoating applied over natural rubber pads on all four sides of the bowl, making them one of he quietest sinks available today. SpecPlus™ Edges are found on most of our under mount models, which is a beveled edge on the outer rim, creating more structural strength and rigidity to the entire unit. StoneGuard™ Sound Control is a specially-formulated undercoating of marble-powder which is first sprayed on, then baked, creating a superior noise-cancellation barrier for clanging dishes and silverware. Most models are available either individually boxed for re-sale or bulk-nested pallets for job-site deliveries. HOUZER individually boxed sinks are specifically cut and inserted to hold accessories like strainers in place. With limited exceptions, HOUZER sinks come with a physical template, mounting clips, installation instructions and Care & Maintenance instructions. Our website, also supports the Architectural and Design communities with printable downloads of all specification sheets and DXF software templates for CNC cutting machines. HOUZER has been a Business-To-Business manufacturer for over thirty years, private-labeling for several well-known brands. HOUZER traded under the Enex brand name for over thirty years, until legally changing to HOUZER, Inc. in May of 2007. In that time, we’ve produced millions of sinks, with current capacity over 500,000 units annually. HOUZER understands that the kitchen is more than just another room. As the most vibrant and visible intersection of the home, it needs to be comfortable, functional and versatile, as well as attractive and inviting. Today’s consumers and professional designers have more competitive options than ever before, encompassing the features, benefits and prices of the products they choose. Our Sinks are painstakingly crafted exclusively with premium-grade T-304 stainless steel, the optimal mix of nickel and chrome for durability and resilience. Many models come with complimentary accessories, such as bottom grids and strainers. Every aesthetic detail is enhanced on every sink we produce to provide lasting beauty and value for years to come…all backed by our Limited Lifetime Warranty. to ultra-contemporary. 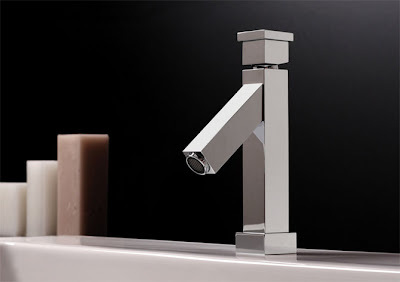 eFaucets.com is the online leader of Faucets and Sinks and is the online leader in Houzer kitchen sinks. 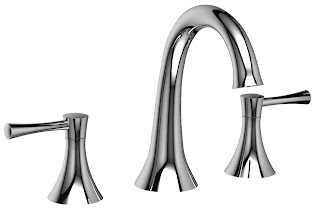 Click here for Houzer sink reviews from customers who have purchased the product and left comments on the product pages. Product search results are also ranked by PowerReviews Click here for Top ranked Houzer Sinks Reviews.